Yes, it's right. 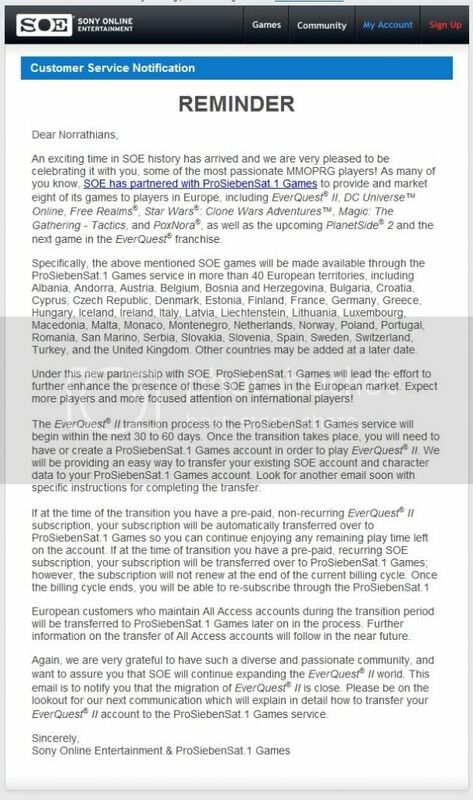 SOE is forcing it's EU customers to sign-up with ProSiebenSat.1 (7Games, a rather untrustworthy MMO publisher). There are just a couple of things not clear in this message, and one of them (the main part actually), is weather or not this only effects the logon to the existing servers, or that all gaming data is transferred to ProSiebenSat.1 as well, forcing all EU players to team up again on new servers. On the EverQuest II forums, this topic is heavily discussed (I only entered today since I missed out on the previous message), and a couple of players tell me that it's only a logon and administration thing that ProSiebenSat.1 will do. I do have to logon using a (new?) ProSiebenSat.1 launcher for EverQuest II and can then logon to the old US servers. On the other hand, the FAQ is not very clear about what's gonna happen, except that we (EU players) are forced to use the new service that's coming up.